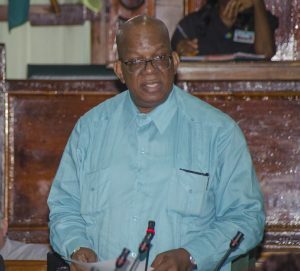 Finance Minister, Winston Jordan prefers to cautiously approach the idea of conditional cash transfers from Guyana’s oil earnings to poor ordinary Guyanese, even as the Alliance For Change (AFC) backed the idea and promised to lobby its coalition partner to refine and take it on board. Welcoming the debate triggered by Distinguished Economics Professor, Clive Thomas’ call for the transfers, Jordan said “we would have to assemble all these ideas that are coming out”. He said if Cabinet agrees to implement a system of conditional cash transfers, it would have to be properly run. “I must admit to you that I will have a difficulty if the Cabinet were to agree to it and in the implementation it wasn’t properly structured,” he said. Jordan floated the idea of funding social programmes instead of doling out cash annually. “Rather than just giving people five thousand (US) dollars a year, why not look at issues such as education, health, youth programmes, small businesses…so I would rather hear more debate about using our resources to create opportunities for people so that they themselves could have lasting incomes as opposed to short-term incomes because monies that you are going to be giving out will soon end and you would have pitched your lifestyle sooner or later to the monies that you receive and when you can’t no longer give those monies, then what is going to happen,” he said. The Finance Minister noted that even now government was giving types of cash transfers for free school uniforms and free meals to students in school. He expressed concern about the fact that there were growing expectations about Guyana’s oil wealth, added to Professor Thomas’ idea. “You start a debate like this that starts with giving people money rather than looking at Guyana, as a country, its problems, how this money can be used to solve those problems…I think we should work at tempering expectations,” said Jordan, a former Budget Director at the Ministry of Finance. He said the focus should be on increasing production rather than merely giving people cash which would instead have to be used to purchase imported foods. Jordan said Professor Thomas’ idea of conditional cash transfers was “ill-defined” because there needed to be clear definitions of what constitutes a household, household sizes, and whether every member of the household should benefit. 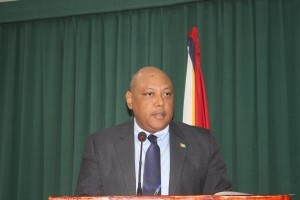 poor would be cultivated into “parasites” with cash transfers, AFC Leader Raphael Trotman noted that direct cash transfers have been used as a tool for economic empowerment. “It is possible if it is structured. You want to ensure that people who receive transfers serve their country and so we may look at it by added value in the pensions, we want to ensure that our people have educational grants, we want to ensure the people who receive cash transfers are registered in our tax system and have paid taxes and not turning up and say ‘i am here to collect'”, he said. Trotman also welcomed Professor Thomas introducing the subject for public discussion at a time when Guyana’s proven reserves are more than 4 billion barrels of oil equivalent. “I do believe this and future governments have a responsibility to spread that wealth in a responsible way to as many Guyanese as possible,” he said. “The AFC supports any initiative that spreads the wealth transparently and equally, not just for some but to ensure that every citizen all ten regions get an equal say in how this money is spent and they get a share of it,” he said. United States-based Economics Professor, Tarron Khemraj has said there was need to conduct a study on the impact that remittances have been having on the labour market to glean the likely impact of cash transfers on the availability of persons to work. Khemraj has also said said such direct payments should be used to improve education and ultimately jobs for the future. Financial Analyst, Sasenarine Singh has further recommended that cash disbursements should be limited to US$90 million per year to persons on the tax and National Insurance Scheme registers. Priorities, he said, should be on improving health and education. However, Economics Professor at Venezuela’s Central Bank. Carlos Mendoza Potella and People’s Progressive Party parliamentarian, Anil Nandlall believed that handing out free cash would cultivate a culture of dependency and parasitism.